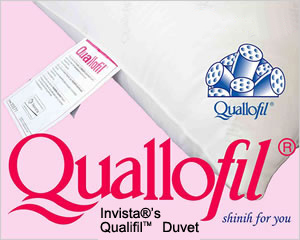 This product is made with Invista’s QuallofilTM fiber--a premium fiber providing superb loft and softness. The air pockets allow maximum containment of warmth. The CLO values of the products remain the same even under wet conditions. However, Invista® products dry triple times faster than goose-down products dry. Safe, hygienic, and easy to clean. 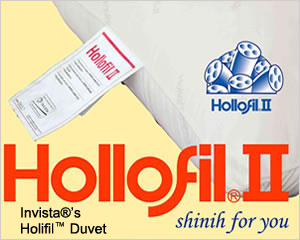 This product is made with Invista® Hollofil® fiber—a special, four - hole fiber traps air to provide durable comfort. Specially processed fibers with supreme loft and high CLO value. 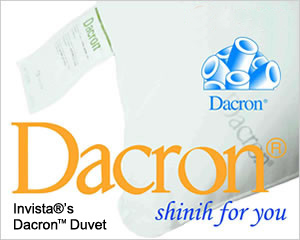 This product is made with Invista’s world renown Dacron® fiber. Lofted, soft, comfortable, and warm. Highly compressible—easy to pack and great for camping and traveling. Compression distortion free—returns to a loft state quickly after unpacking the product from the packaging materials.